I'm totally hopeless in the nail department. I once tried to paint my nails bright red and ended up looking like an extra from a horror movie. That's why I was thrilled to get the opportunity to try out Dinki Belle's nail wraps, which promised 14 day wear and a fast and simple application process. 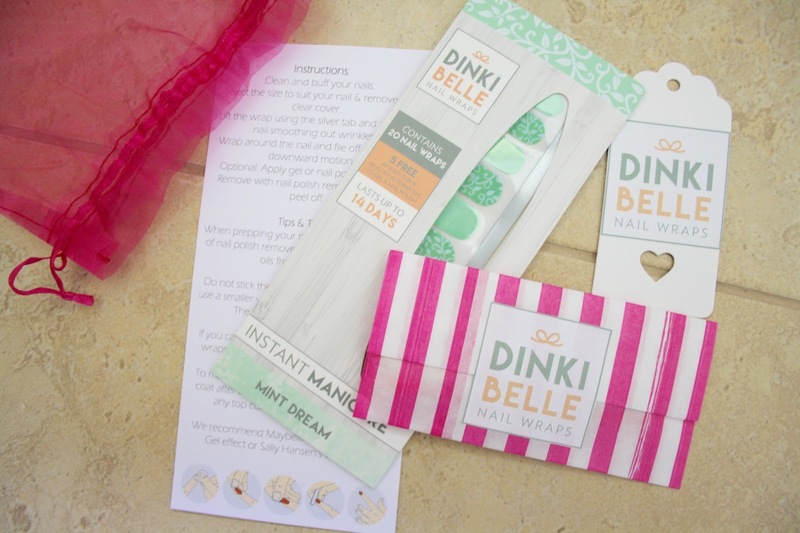 Everything that you need to apply the nail wraps is provided in the packs from Dinki Belle. You receive a set of 20 individual nail wraps, an instruction card to tell you how to apply them, and a set of utensils, which comprises a nail file, and some plastic and wooden tools. All of the items are packaged together in a pretty pink tulle bag. The design that I chose was 'Mint Dream'. I loved the combination of patterned and block-coloured wraps, which I thought would look lovely when applied! 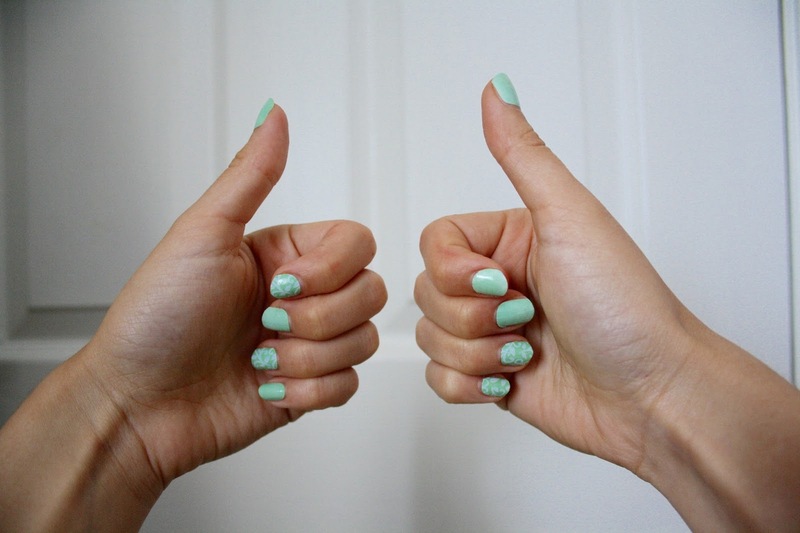 As well as their obvious aesthetic qualities, I was attracted to these nail wraps after reading an article on Dinki Belle's site about the health benefits of choosing a nail wrap over traditional nail polish. To summarise the article, which you can read in full by clicking here, there are many toxic chemicals present in some nail varnishes, which although legal, can be damaging to your health. 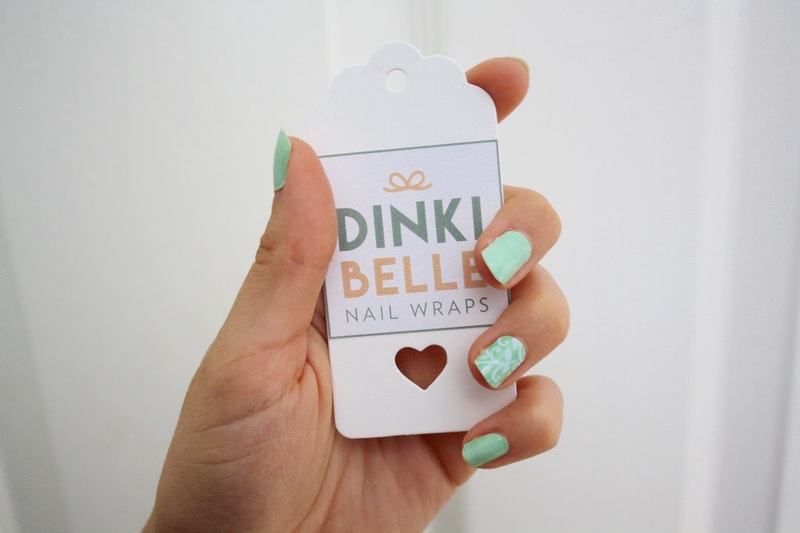 Dinki Belle's nail wraps are free from any such chemicals and are therefore much safer to use. But now, onto the fun stuff! How did the nail wraps hold up in my test? I'm sure you'll agree that these nail wraps look awesome! When I showed my new nails to my Mum, she couldn't believe that they were stick-on! I have had loads of compliments since applying the wraps, with many people commenting on what a professional job I did with them. I can take no credit for this whatsoever, it all goes to Dinki Belle! If the most useless nail person on planet earth (that's me by the way) can do this, you can do this! The application process was SO easy. All you do to apply the wraps is peel off the back, stick them to your nail, and file away the excess. I sat down planning to spend an hour putting the nail wraps on, and I was finished within 15 minutes. All the tools were provided with the kit, which means that you don't even have to scramble about the bathroom in search of a nail file! Perfect if you're lazy, like me. If you have small child hands like me (no exaggeration - I wear childrens' gloves in the winter), you may find that some of the wraps are just too big for your tiddly fingers. All you need to do to fix this is to cut down some of the larger wraps to fit your nails. This wasn't difficult at all and took only moments. This was my big worry with the nail wraps, I was afraid that as soon as I plunged my hands into some soapy water, off my nails would come! I am happy to report that this was not the case! I subjected the nail wraps to baths, showers, washing up, and many tasks which would have chipped regular nail polish such as household cleaning. No damage was sustained by the nail wraps at all, they didn't begin to peel, and they didn't crinkle at the ends. I was genuinely impressed. This was quick and painless, and didn't involve soaking your hands in foul smelling acetone, as is the case with plastic stick-on nails. You just peel off the nail wrap when you're finished wearing them. Dinki Belle say that you can use nail polish remover if you find the wraps a little stubborn, but I found that simply peeling them away worked absolutely fine. These wraps are very budget-friendly too. One set costs £6.99, but you are able to do multiple manicures with each set. I will definitely be able to get another full set of nails out of my leftovers from this kit. If you live in the UK and you place an order with Dinki Belle online to the value of £10 or more, you get free shipping too! To browse Dinki Belle's full range, click here. Let me know which of their designs is your favourite in the comments below! * This post contains samples that were sent to me for review.